Chelsea is among the top clubs of the Premier League. Last year they have regain their title and hopeful to retain the title this year (2017-2018). The club signed some of the expensive football players. Diego Costa, Eden Hazard, David Luiz, and Willian among top paid players in the squad. 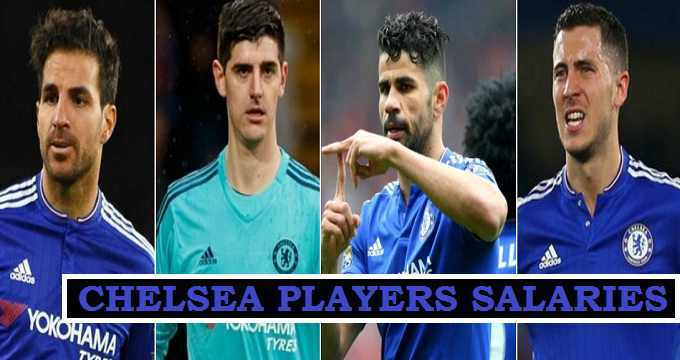 Well here you will find out how much weekly wage and salary taken by Chelsea players. Chelsea is ranked among the top 10 richest football clubs. Last year in 2016 the team changed the manager and its (Antonio Conte) who bring Chelsea winning form back and complete the season with Premier league title. In 2017 club bring new players back which include (David Luiz, Alvaro Morata, and Tiemoue Bakayoko). Note : These weekly wages as you see in the above table estimated. These are not accurate details because no Premier league club disclose contract details of the players. So the details as you see in the above table about wages were taken from trusted sources. Antonio Conte Salary (£6.5 Million) : he is an Italian football manager, who signed 3 years deal with Chelsea F.C in 2016. According to some sources his contract with Chelsea ended in 2019. After signing with the club he become 5th world highest paid football manager. After joining the club he won his first (Premier League trophy 2016-17).